Fundamental Analysis is the oldest and most traditional method for evaluating listed companies, and is widely used by the investment community. In essence it seeks to determine the value of a company by studying its underlying financials, with a focus on items such as earnings, cash flow, debt and assets. The better a company is at generating profit, and hence a return for shareholders, the more valuable it is deemed to be. Not only do fundamental analysts attempt to understand the “financial health” of a business, but they also seek to evaluate all factors that are likely to impact on future profitability, and in this way attempt to determine whether or not a business represents a good investment at current prices. 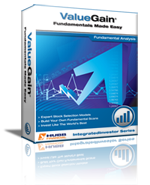 When it comes to fundamental analysis, there is no better tool available than ValueGain software. Take the ValueGain Tour. HUBB Financial aims to empower people to plan, build and protect their wealth. Founded in 1997, our innovative investment tools and leading edge investor education programs help clients take charge of their financial destiny. We believe that in the world of the self directed investor...education is the new advice! The world has changed… investment and wealth planning is no longer the domain of the wealthy. HUBB Financial supports the growing numbers of DIY and self-directed investors actively making their own investment decision every year. Our customers access an entire support network for investors including educational webinars, multimedia training online, regular video market updates, newsletters, live workshops, one-on-one investment coaching and an entire online community of investors. Our live education courses are second to none because we employ real investment and trading professionals to lead these classes. This means that the information is presented in a pragmatic and practical way that gives students a true insight into what it takes to apply the strategies and make them work in the real world. Additionally our students are taught with relevance to the current financial market scenarios. The company’s Investor Tools division dovetails with the Education division to provide online and software tools supporting the strategies taught to clients. Products are unique in their ability to assist clients in applying an integrated approach to investments including technical, fundamental and options analysis tools on one platform. They provide clients with the most highly featured analytics to support investment selection and the capability of trade execution via supported online brokers. The platforms rival the very best retail investment and trading applications available globally.